There's nothing more eye-popping than dahlia flowers. The colours dwarf even the most psychedelic Italian gelato. Yum! 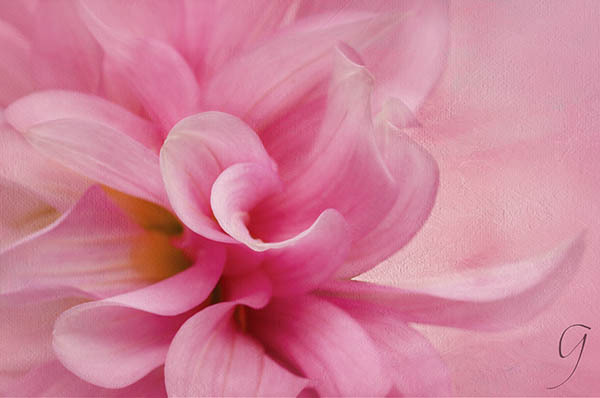 The only way to top a dahlia photograph is to turn it into a masterpiece of painterly photography. Roll out the textures and fire up Photoshop. Lavender, white and yellow dahlia close-up. I saved this bud from a neighbour's fall yard clean up. It bloomed beautifully and gave me many gorgeous photos. 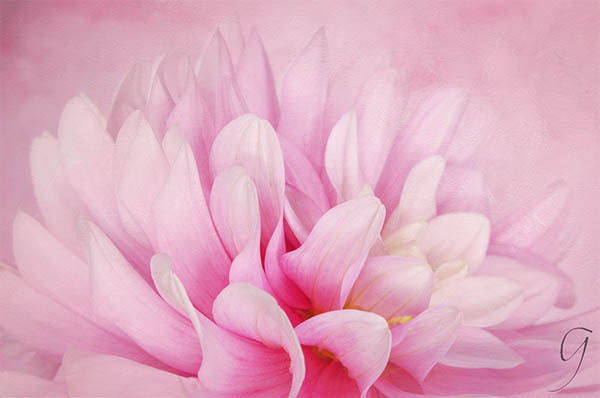 All of my dahlia images on this page, as well as many more beautiful flowers from all around the world are available as both prints and note cards. Browse and find your favourites. Click on the images below. I love living here, ocean-side on Vancouver Island. So, you'll also find lots of lovely impressionist images of the fishing boats, sea shells and our indigenous animal life as well as the flowers. How do you like the artistic touch I give my photos? The unique painterly style is a reflection of how I feel about the scenes. It gives me great joy when I know that others appreciate my work. If you have a comment, please leave one at the bottom of any page or contact me. Got an obsession for intense colours? Dahlias might be your darlings. But, flashy colours aren't their only virtue. They have a long blooming stretch from spring through fall. If a winter without is too much for you to bear, pick some up from the local flower shop. Here's how to put together a DIY home photo studio. I can work one dahlia bloom for hours... days, even. They stay fresh in a vase for at least a week. For the few dollars they cost, they're a productive investment. 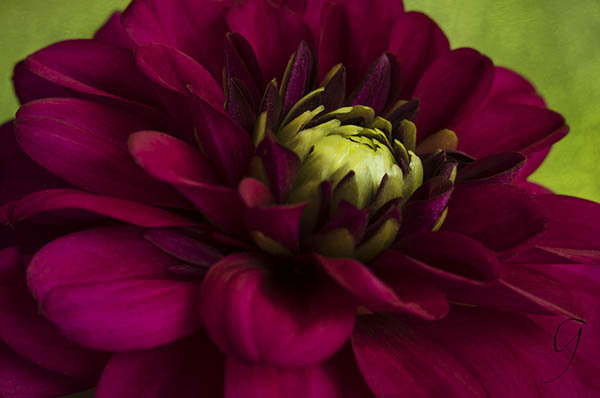 Dark and mysterious magenta dahlia with a lime twist. An eye-popping colour combination. Lime green and magenta are a splashy pair. What do you think? Mother Nature comes up with the most incredible colours. 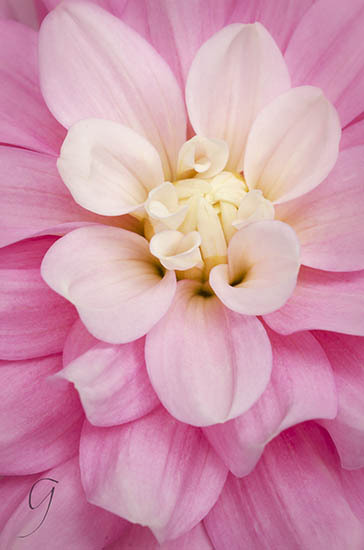 This dahlia image looks amazing as a fine art print. They encourage us to follow our inner guidance and remind us of how powerful we are. They tell us that one person can make a big difference in the lives of all the people around us. 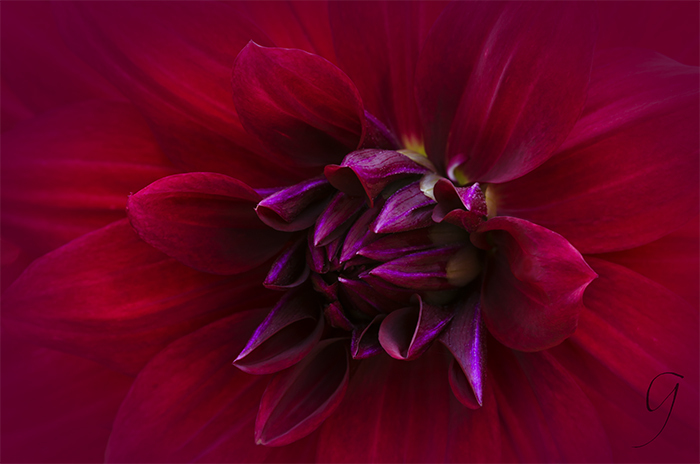 Most of the images of dahlia flowers on this page were taken with my Lensbaby Velvet 56. I wanted one of those "babies" for so many years. And I'm overjoyed with the results. A Lensbaby takes practice but if you stick with it, you'll be rewarded. 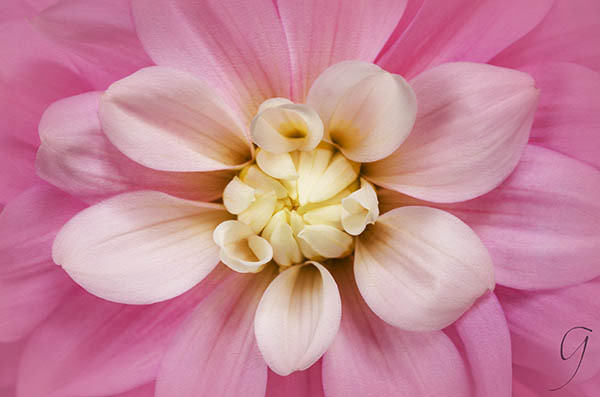 A perfect match for flower photography because of the soft, ethereal quality it produces. A close-up of a pink bloom with its twirly florets. Dahlia centres have super curves for macro photos. The Velvet 56 was my first choice. It's a fixed lens, different from the optic swap system like the Composer Pro II with the Sweet 50 Optic. That's next on my wish-list. Lensbabies create a soft focus around a small area of sharp focus. Outside that focus, the lens produces a beautiful, soft image with some distortion. "When you look at a flower, you first see the whole flower, its color and shape. As you keep looking, you see the petals and veins and stamens and pistils. When you look more closely still, you see the segments and shading in the petals, until you begin to feel the vastness of those details. To see the vastness by looking at one thing in its details is to see its sacred connection to space and to all other things." The darkest dahlias are my favourites - they're mystical. 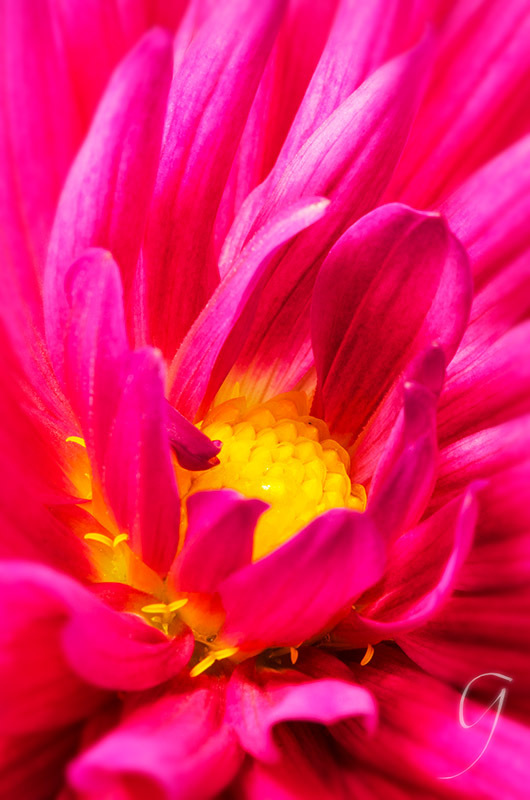 There's an astounding variety of colours and textures when you look through a macro lens at a flower like this. I took this photo with a Nikon 105 mm macro lens. A dahlia in window light. Beautiful natural light is reflected off the red petals. If you're loving the images on this page, why not purchase one? Or a few? They're all available as prints or note cards. Here's where you can purchase these, and more! Fuchsia dahlia with a yellow centre. Nikon macro 105 mm lens. Some dahlia flowers fit into a vertical composition perfectly! Like this one. I love the tiny yellow florets and the yellow against the brilliant fuchsia. This flower was very small and the photo was taken with my Nikon 105 mm macro. When you look through a macro lens, there's such an amazing world that you otherwise miss entirely. My photo editing software is primarily Photoshop when layers are involved. Lightroom handles all of your 'developing' but, if you plan on adding textures, you'll need to move over to Photoshop. You can shuffle your images smoothly between Lightroom and Photoshop, though some folks use Photoshop with Adobe Camera Raw and Bridge and never use Lightroom. 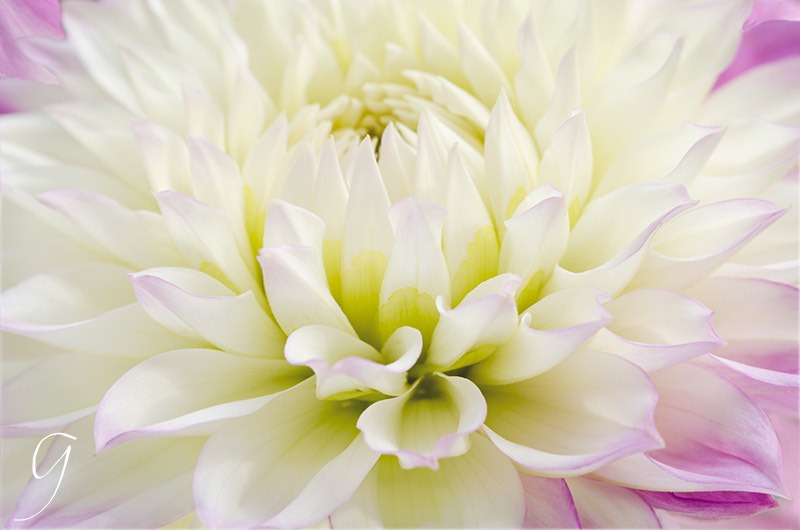 Dahlias are curvaceous and elegant. Take your time and examine them from all angles. Work each flower slowly and get multiple shots. Do a Google search to find free textures or shoot some of your own. I keep a file of photos of rusty metal, rocks, concrete or wooden walls, old wall paper... anything... use your imagination. Most of the textures I use now make my photos appear to be paintings. Get them from French Kiss Textures. A sensational dahlia in a pallette of dainty pinks. I took my time looking through the lens and changing angles to capture these gorgeous petals. All the dahlia flowers on this page were photographed indoors. It's usually breezy here on the Island and when you're shooting macro images, even a teeny-weensy petal movement creates blur. Breezes always make for a wasted effort. I use my tripod every time for macro or close up photography, natural light, a background pasted on foam board, and one or two twist ties to keep unwanted flowers or leaves out of the way. 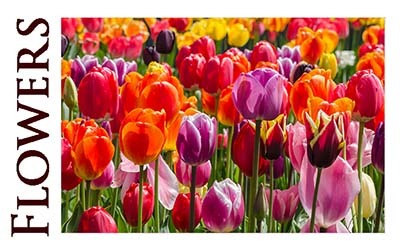 Shoot horizontal and vertical photos of your flowers. You may like one view better. Make sure you fill the entire frame with your bloom. Dahlia flowers are such a diverse, gorgeous, colourful group of flowers. The ones I love best are the darkest colours but there are plenty of lighter pastels, and they're gorgeous, too. If you're running into problems on a breezy day when you're going for macros or close-ups, pick a few and move them inside to your DIY home photo studio. 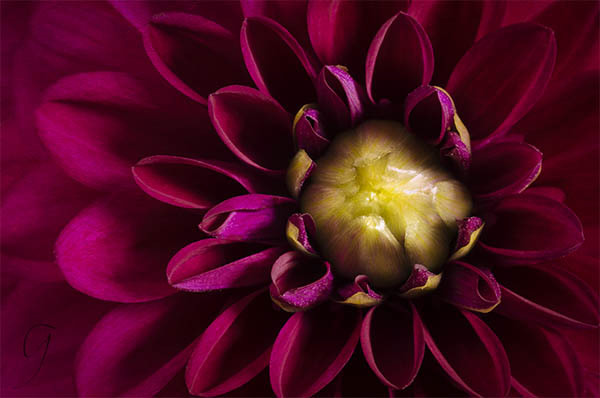 Either inside or out, photographing dahlias is a blissful way to spend a few hours. Kick back, relax and enjoy yourself. 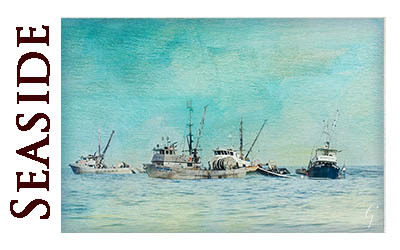 If you like my images, I'd be thrilled if you'd order a print or some note cards to send to friends. :) Share the beauty!